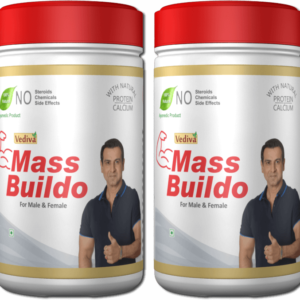 In this blog, we will discuss some mass building workouts to get a muscular body. Every man dreams of having a perfect body like that of a Greek God. Some are genetically fortunate to possess such a well-toned figure whereas some have to slog to achieve it. There are no shortcuts to attain a body which you dream to desire. Proper nutrition and meticulously planned exercise regimen are necessary. They complement each other and cannot provide the desired effects single-handedly. I had mentioned about the diet to be followed to build muscle tone in my earlier blog. Now how to ingest the diet and allow the body to absorb the nutrients to gain mass is a big question. The idea is to work on each aspect of the physique gradually and see how it transforms naturally. So let’s get started with a warm-up exercise first and subsequently concentrate on your upper and then lower parts of the body. A well-defined neck commands respect and authority. But very few take time to address the issue for training purpose. You cannot have a pencil thin neck with a muscular body. The top 5 exercises that will help to build your neck muscles are Barbell Shrugs, Dumb Bell Shrugs, Upright rows, Overhead presses and Lateral Raises. These exercises develop neck muscle and shoulder muscle too. You can begin with stretching your neck muscles by bending the head downwards touching the chin without opening the jaw. Slowly you can tilt your neck towards each side of your shoulders alternately. Increasing Trapezius muscle and the strength of it is essential. When we talk about Traps, usually the development of Upper Trapezius comes into the picture. The upper Traps focuses on shoulder elevation and also assist in the mobility of head and neck. Shrugging the shoulder relieves the tension of the neck and reduces headaches caused due to the tightness of upper Traps. The middle and lower Traps become active due to ‘Back Exercise’ such as rows. The middle and lower Traps are responsible for the proper motion of scapular adduction along with the rhomboids. The best workout for Traps is ‘High Pulls’ –like lifting weights from the floor. Your grip on the weight should be wider than your shoulder width. Bend your knees slowly and lift the weight in the air, raising the elbow as high as you can. 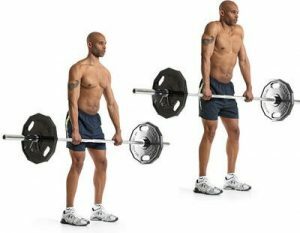 You can alternately perform high pulls with dumb bells and barbells. The most unstable joints in the body are the shoulders with a varied range of motions. Since it is prone to injuries, it requires utmost care. The shoulders are triangular in shape and comprising of 3 distinct heads viz. Anterior, Medial and Posterior Deltoid and constructed as ball and socket joint. You can perform the exercise with Barbell Shoulder Press and Dumb-Bell Shoulder Press either standing or sitting. 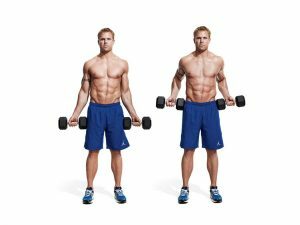 Flat Bench Dumb Bell Press– Workout with Flat Dumb Bell allows you to balance heavyweight fairly and useful for those who wish to upgrade from Barbell Bench Press. Low-Incline Barbell Bench Press –It is a good practice to start chest workout with inclines as it puts a considerable amount of stress on Upper Pec fibres. Machine Decline Press– It is performed on a machine decline apparatus by sitting sideways and pressing your body one arm at a time. Seated Machine Press– These are stack-loaded machines which assist you to pump mass in your Pecs. Bar Bell Curl– Bar Bell Curl are slightly heavier than dumb bells and so care has to taken by not rushing into it. If performed with low momentum can produce incredible effects. Incline Dumb Bell Curl– Here the body is placed in a decline position as opposed to the bench which is inclined. You have to sit on a bench which is inclined to about 45 to 60 degrees and raise one dumb bell about 1 second to hit the top of the rep.
Building forearm is crucial to tone the upper part of the physique. The strength of the forearms, shoulders, and biceps has to be enhanced to hold greater weights. The Certain workout can easily target the forearms and increase its strength. Lifting heavy Dumb Bells– You can begin your workout by lifting heavy dumb bells or kettlebells in each hand. Gradually you can add more weights but not so heavy to cause discomfort. Use of Bar Bells– You can curl Bar-Bells up and towards you and gradually maximize the potential of each repetitive movement. You can curl your wrist to bring the barbell close to your chest and loosen it before letting it down. Planks (2 minutes)– Place your forearm into the plank position on the floor with elbows aligned below your shoulders. Hold the position for long as you can. Pause and then repeat the activity for 2 minutes. Handy bar-grips– The good old Bar Grip with a metal coil is one of the best and safest ways to work on forearm muscles. You can also use a soft tennis ball and squeeze for a better hand grip. 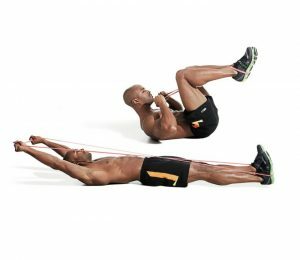 Crunches (2minutes): The most reliable and old-fashioned technique, to begin with, is the crunches. Lie on your back on the ground, bend your knees, cross your arms in front of the chest and lift your shoulder high from the ground to put tension on the abdomen. Burpee (2 minutes): Stand with your feet apart and lower your body into a squat by placing your hands on the ground. Kick your feet into a push-up position and repeat the activity for 2 minutes. Planks (45-60 seconds): Lie on the floor in a pushup position and bend your elbows with your weight resting on forearms. Lift your elbows slowly above the ground to make your body form a straight line from head to toe. Those who wish to build an impressive physique, thigh muscles are one of the prominent parts to be toned. It is essential to have a strong leg and thigh muscle to provide support in performing rigorous workout session. You have to dedicate 20 minutes for muscular thunder thighs. The following workout will do the needful. Squat: Begin with basic squat for about 4 minutes. Keep your arms stretched and squat to reach an imaginary chair. Repeat the activity a couple of times. As you advance, introduce variations like air squats and jump squats. Static Lunge (4 minutes): Stand with your right foot forward and left at the back. Keep your upper body straight and slowly bend your knees till it almost reaches the floor. Repeat the exercise with your left leg. Split Squats (4 minutes): Place your feet few inches wider than the shoulder width with arms at your side. Squat by keeping your upper body erect and repeat it for about 4 minutes. Raise the Calf (4 minutes): Stand with your feet apart and raise your toes as high as you can. You can hold a chair for better support. This activity will strengthen your calves and the muscles surrounding it. Bridge the leg shoulder gap (4 minutes): This activity involves correct breathing pattern. Lie on your back and raise your right leg from the hip to come in line with the knees in a straight line with your arms stretched out in parallel with your leg position. Continue the same with your left leg. Hectic schedules may restrict you from performing all the above exercises. But you can always begin with a small exercise regimen each day as it proves very beneficial in the long run. Share if you agree with me and leave a comment. This entry was posted in Mass Buildo, Underweight and tagged Exercises, Mass Building, Mass Buildo, Workout. Bookmark the permalink.